MicroStrategy, founded in 1989, is one of the best known vendors in the BI market worldwide. In 2003, it became the first vendor to release a fully integrated product that provides formatted reports, dashboards and interactive analysis in a single solution using the same infrastructure. In general, MicroStrategy has always taken market trends seriously. It was among the first vendors to present solutions for mobile devices. The vendor provides a development framework to build individual mobile applications. Offline capabilities and data entry for operational use cases are supported as well. With its library of statistical and advanced data mining functions, the vendor offers comprehensive analytic capabilities for a wide variety of use cases. MicroStrategy has one of the best architectures on the market, built from the ground up without acquisitions. The vendor focuses on providing solutions a customer needs to become an “Intelligent Enterprise”. The analytics and mobility suite are built as a front end which connects to a variety of data sources using its own semantic layer to create a common and governed business logic layer. The vendor has invested much over the years in supporting new data sources, such as from the web and cloud data, as well as offering native support for Hadoop systems. Besides direct connectivity to source systems, MicroStrategy has used PRIME (Parallel Relational In-Memory Engine) as the core in-memory engine of its analytics platform since version 10 (first released in 2015). The product is designed to provide high performance to very large numbers of users on very large data sets. MicroStrategy has always taken market trends seriously. It was among the first vendors to present solutions for mobile devices. The vendor provides a development framework to build individual mobile applications. Offline capabilities and data entry for transactions and operational use cases are supported as well. To fulfil requirements in the area of self-service BI and data discovery, MicroStrategy has a standalone self-service BI client called MicroStrategy Desktop. A similar web-based data discovery module is available with the MicroStrategy Web product. To provide modernized ways to work with information, MicroStrategy introduced “MicroStrategy Dossiers” as intuitive, interactive applications that organize intelligence in a familiar book-oriented chapter and page structure. Users can navigate through reports and visualizations, share insights and collaborate with colleagues. MicroStrategy uses a classic three-tiered architecture consisting of a database server, application server (Intelligence Server) and front ends. Due to the software’s historical development with no acquisitions to date, the entire platform is based on the same codebase that integrates all the components. Unlike last year, the majority this year’s respondents have now moved to version 10, which has been available for three years now. Only 10 percent of our respondents still use the old versions 8 and 9. 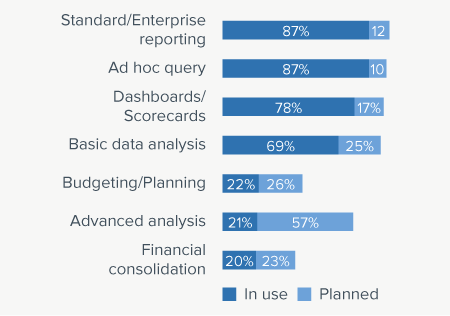 MicroStrategy Analytics Platform’s usage scenarios reveal the product’s versatility. The suite offers a good feature set for various scenarios such as standard reporting, ad hoc query, dashboards and data analysis. Survey respondents seem to use these four capabilities heavily. 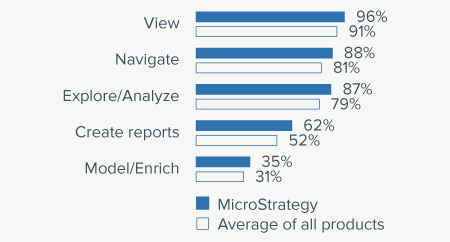 57 percent of MicroStrategy customers say they plan to use the product for advanced analysis. In this area, the vendor has an extensive statistical library, which can be used for statistical calculations. In its data discovery modules for business users, the vendor recently began providing some predefined statistical calculations as well. MicroStrategy’s usage rate for model/enrich tasks is slightly higher than last year, showing that customers are slowly adopting these data discovery capabilities. 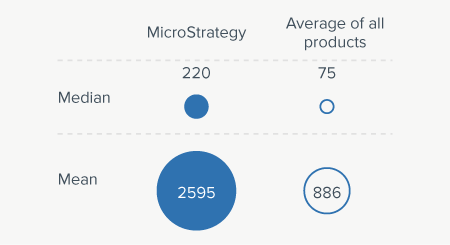 Company size and user numbers show that MicroStrategy is mostly used in larger scenarios and large enterprises. The suite is capable of handling high volumes of data and user numbers. Indeed, customers often cite these factors as major reasons for buying the software. BARC’s Vendor Performance Summary contains an overview of The BI Survey results based on feedback from MicroStrategy Analytics Platform users, accompanied by expert analyst commentary.